Vandas are not properly beginner's orchids, and even among more experienced growers, they require certain elements that can be hard to deliver at home. They need high humidity and high temperatures, bright light, and turbulent air flow. They need periods of drenching "rain" followed by a hard dry period. And large specimens, including their curtain of aerial roots, can easily grow to five or six feet in length. Obviously, these are not plants most people can easily keep in their homes. They are more properly greenhouse plants where they flourish under overhead irrigation and bright sunlight. Yet I'm including them here because of their sheer importance to the serious orchidist. These plants win a lot of awards and are the subject of focused, serious and long-term breeding efforts to produce the showiest, largest, and flattest flowers. Vandas are in the Vandae tribe and Sarcanthinae subtribe of orchids. They are native to the east Asian tropics, ranging from Sri Lanka to China to the Phillipines to Australia. In all, there are about 40 species of Vandas, but that doesn't even come close to recognizing the number of hybrids, of which there are thousands. Vandas are monopodial orchids, meaning they grow from a single stem, with roots emerging from the bottom of the stem. Vandas' leaves are alternating, climbing the stem in a ladder-like progression. Older Vandas frequently branch, and if left undivided, the plants can grow into very large specimens. Vandas flower from spikes that emerge from the central stem and poke out between the leaves. Vandas are known for very large, robust roots that are difficult to contain in any sort of pot or container. Vandas require bright light, but generally, do not thrive in full sunlight. I've seen Vandas acclimated to full sun, but these plants are generally washed out and not as healthy as those grown under a light shade cloth to take the edge off strong sun. Vandas are occasionally grown in plastic pots with sphagnum moss and orchid media, but this is a far-from-ideal situation. Instead, most growers prefer to grow Vandas in slotted baskets, where their roots are free to dangle toward the ground. Plants grown like this require a great deal of water. In periods of high temperatures, Vandas might need to be watered twice a day. When watering a Vanda, first soak the plant until the white or silvery roots turn color. Then wait a few minutes before again saturating the plant. Overall, the plant should be under spray for up to 8 minutes. Some growers leave their sprinklers on for 20 minutes and swear by it, but I've been told by Vanda breeders that Vandas cannot continue to absorb water beyond about 8 minutes. Seriously dehydrated Vandas can be floated in a bucket of water (just put the whole plant in) for a while to rehydrate them. Vandas are heavy feeders, and well-fed plants bloom better. During the growing season, fertilize with a liquid-based, weak fertilizer weekly. Plants that are grown in plastic pots can be fertilized with controlled-release fertilizer pellets in addition to the liquid-based fertilizer. Vandas are warm-house orchids that prefer temperatures above about 65 F. They can tolerate lower temperatures, but a prolonged exposure to colder temperatures will have a profound effect on the plant's growth and flowering. Exposure to any temperatures below 50 F can cause delayed flowering for up to a year. The only real exception to this is the Vanda coerulea, one of the few true blue orchids. These Vandas can handle cold temperatures better than many of their cousins. Vandas will bloom throughout the year, depending on their growing conditions. Healthy, happy plants with plenty of access to light, warmth, and moisture will bloom at any time. Vandas bloom from spikes that emerge in a predictable pattern from between leaves. The flower spikes have multiple flowers, depending on the plant, and the flowers will stay open for a matter of weeks. 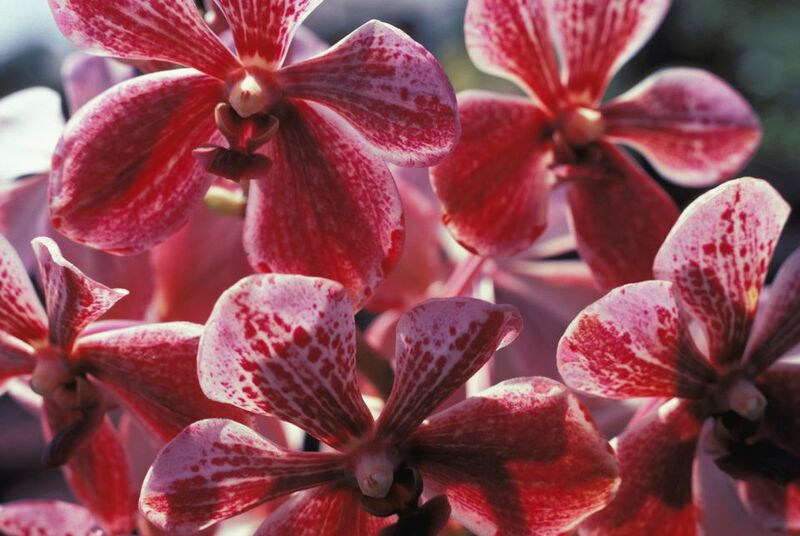 Vandas are generally chosen for their blooms, with flowers in hot pink, red, blue, purple, or mottled. The choicest flowers are flat and round, with very bright colors. Vandas are big, robust plants that will quickly outgrow most containers. They do best in situations where their large aerial roots are allowed to meander through the air or grasp onto a substrate. I've seen them successfully grown mounted to trees or buildings, but really, the best way to grow vandas is in open baskets with no substrate. To start a Vanda, weave the roots through the basket slots and wire the stem base in place with plant wire. Large Vandas might not need repotting at all, as they will continue to grow beyond the edge of the basket. If, however, your Vanda needs repotting, it is usually best to set the old basket inside the new basket and simply leave it at that. Vandas and their many hybrids and related species are, to some degree, instinctive plants. Their basic requirements—air flow, warmth, bright light, high humidity, copious watering—are well known, but only go partway in describing the best growing conditions. And because they are typically grown without substrate, they are particularly sensitive to cultural conditions. The difference between a well-grown Vanda and a substandard Vanda, even in the same species, can be profound. Well-grown Vandas reward their diligent owners with profusions of blooms, multiple spikes per year, and vibrant colors. Substandard Vandas begin to lose their leaves from the bottom until the stem is gradually denuded. Aside from flowering and retaining leaves, you can tell a great deal about the plant's health from its leaves: they should be green to light green and unblemished with dark spots. Black or yellow spots usually signify a problem. In my experience, though, the number one problem with Vandas is lack of water—to grow healthy Vandas, make absolutely sure they are adequately hydrated.